Professor Victor Ngonidzashe Muzvidziwa has been installed as the 2nd Vice-Chancellor of the Midlands State University. Professor Muzvidziwa joined Midlands State University in 2013 as the Pro Vice-Chancellor for Research and Academic Affairs and was appointed Acting Vice-Chancellor in 2016, before being appointed as substantive Vice-Chancellor in 2018. Speaking during the installation ceremony, the Zimbabwe Universities’ Vice-Chancellors’ Association (ZUVCA) and Chinhoyi University of Technology Vice-Chancellor, Professor David J. Simbi described Professor Muzvidziwa as a capable leader and welcomed him to ZUVCA. 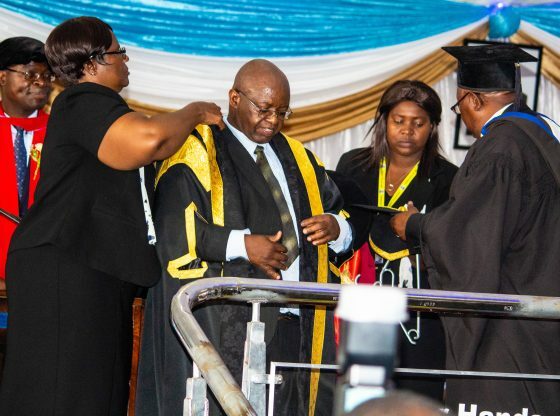 Congratulating Professor Muzvidziwa, the line Minister, Professor Amon Murwira called on the newly installed Vice-Chancellor to work hard, to be selfless, to give credit where it is due and teach others while also remaining teachable in order to succeed. Midlands State University founding Vice-Chancellor, Professor Emeritus Ngwabi Bhebe commended his successor for hitting the ground running since assuming office, noting the significant strides made by the University to date in regards to infrastructural development. The Midlands State University‘s administrative, academic and student bodies represented by Council, Senate and the Student Representative Council (SRC) respectively all took turns to congratulate the Vice-Chancellor as well as assure him of their support. In his acceptance speech, Professor Muzvidziwa expressed gratitude to His Excellency, the President of Zimbabwe and Chancellor of Midlands State University, Cde Emmerson D. Mnangagwa for entrusting him with the leadership of MSU. The Vice-Chancellor also paid tribute to the University’s founding Vice-Chancellor, Professor Emeritus Ngwabi M Bhebe and founding MSU Council chairman, Mr Canaan F Dube. ‘I am highly privileged to follow in the footsteps of the founding Vice-Chancellor of the Midlands State University, the renowned historian and administrator par excellence, Professor Emeritus Ngwabi Bhebe … Your Excellency and Chancellor, MSU would not have reached such commanding dizzy heights without the able leadership of Mr Canaan Dube, an astute lawyer and corporate governance guru’, he said. The installation ceremony which was held amid great joy and celebration was witnessed by the Vice-President, Honourable Rtd General Dr Constantino G. D. N. Chiwenga, Minister of Higher and Tertiary Education, Science and Technology Development, Professor Amon Murwira, Minister of State for Provincial Affairs in the Midlands Province, Honourable Larry Mavima and the Minister of Local Government, Public Works and National Housing, Honourable July Moyo as well as members of Muzvidziwa family among others.